Since the formation in 1997 of the Chelfitsch (“selfish”) Theatre Company, a collaboration with dancer Natsuko Tezuka, Japanese writer and director Toshiki Okada has developed an international reputation. Informed equally by Japan’s “quiet theatre” movement of the 1980s and 90s, and his early interest in American alternative cinema, Okada’s theatre is distinguished by a heightened style that marries colloquial language with Brechtian distancing techniques. 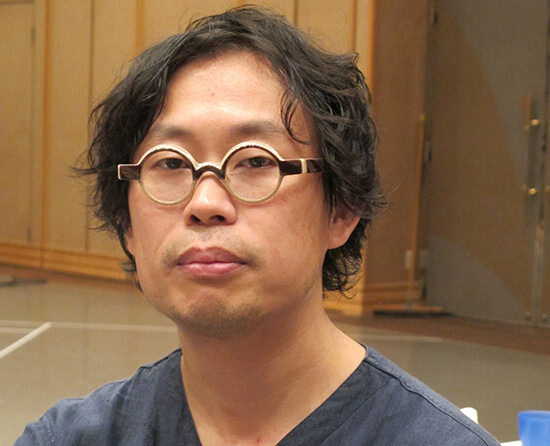 Strongly political, his work has often been read as sympathetic to Japan’s so-called “lost generation,” which came of age during the crippling recession of the 1990s. 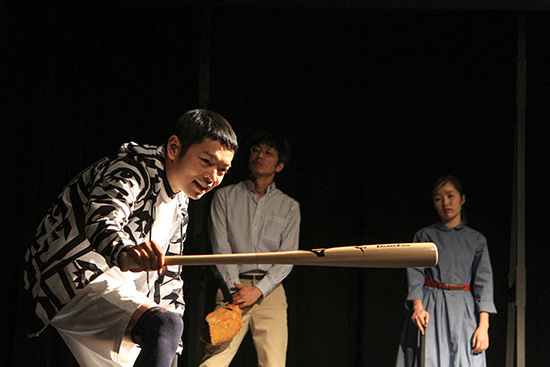 His most recent work, God Bless Baseball, had its world premiere in South Korea last year and has since been performed in Tokyo, New York and at Braunschweig’s Festival Theaterformen. 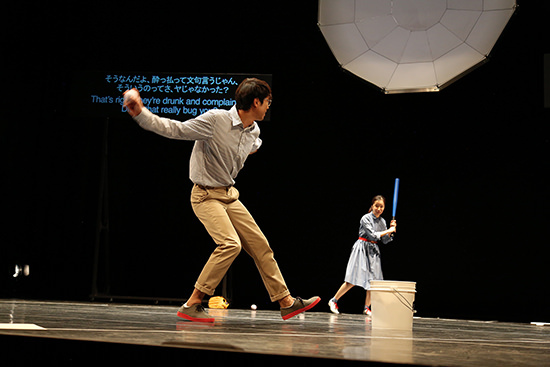 The play uses a mixed ensemble of Japanese and South Korean performers to explore those countries’ relationships to the United States through that icon of cultural imperialism, baseball. It’s a sport that, since its introduction to East Asia by American educators and missionaries around the turn of the 19th century, has become thoroughly nativised in Japan and neighbouring South Korea. I spoke to Okada via Skype ahead of the work’s Australian premiere at this year’s OzAsia Festival in Adelaide. If he is able to make it to Adelaide for the festival—he’s still not sure if his schedule will allow it—it will be only the second time he has been to Australia, following a short season of perhaps his best known work, Five Days in March, at Melbourne’s Arts Centre in 2010. In the play you set up Japan and South Korea as siblings, with the United States as a kind of father figure. Did that idea come first, and then you decided to use baseball as a way of expressing it, or was the initial spark to do with wanting to write a play about baseball itself? The biggest trigger was that I was invited to create a new production for South Korea’s art complex in Gwangju [The Asian Arts Theatre, a part of the government-funded Asia Culture Centre in Gwangju City]. I started to think about an international collaboration, specifically with South Korean artists. It was an idea that they really liked. And then the topic of baseball came to me because that sport was something both countries had in common. And of course, the reason Japan and Korea are so familiar with baseball is because of the great cultural influence of the United States in this part of the world. Australia’s relationship with the United States is in important respects similar to Japan’s and Korea’s. How do you personally view the relationship between Japan and the United States at the moment? I’m thinking of the current tensions around the United States’ military presence in Japan. Big question! I have to say that Japan is still a kind of colony of the United States so we have to start thinking about how we can move beyond that. For example, there are many United States military bases still in Japan, which doesn’t make sense from my point of view. And Japan is paying for them! So there are many things about this relationship that remain to be solved. I think it’s almost time for Eastern Asian countries such as China, Korea and Japan—and probably Australia too—to set their own programs without any interference from the United States. I wanted to ask you about how the translations work in the show because, as I understand it, parts are in Japanese and others in Korean. So how do those translations into English work across the performance? When it comes to the English language, I am very happy to have an excellent translator [Hongyie Lee] who has been working with me for a long time. In the case of God Bless Baseball it’s a bit unusual because normally in my work there is only Japanese, but this piece contains Korean as well [two screens provide Japanese to English and Korean to English subtitles, and a voice-over provides additional commentary in English]. There’s a character in the play inspired by the legendary Japanese baseball player Ichiro Suzuki who acts as a mentor to two novice players. The character is portrayed by Pijin Neji, a Butoh-trained dancer. How did his involvement influence the development of the production? When we started to think about how the United States relates to Japan and Korea we found three different aspects that we thought were important. One is that the United States is above us. The second one is that the United States is behind us. And the third one is that the United States is inside us. So if we tried to be independent from the United States we would have to do it through these three ways. And I realised that if we were to do this, the most difficult one would be the third because the United States is already inside us. Because its cultural influence is so pervasive? Yes. We had to find a way of realising that in the performance so that’s the reason I wanted to work with a Butoh dancer. They are good at working with their bodies and I knew this aspect of the show needed a choreographic solution. One very important sequence in God Bless Baseball that Pijin Neji had a lot to do with is when all of the characters try to get the United States out from inside them—it’s weird and serious at the same time, which I like. Can you talk a little about how important the show’s design aspects are, especially given designer Tadasu Takamine’s reputation as quite a provocative visual artist? I asked him for basically one thing: to create an object to represent the United States that could collapse or melt or disappear, something like that. I explained to him that I wanted to be able to use the object to show a future in which we are not as dependent on the United States. This appealed to him because in his work in the visual arts world he is always interested in political and social issues. And so he came up with a design that the production team thought looked like an umbrella or an antenna, and it melts away at the end of the play. For me, it represents an alternative future for us. It’s quite direct really but American audiences couldn’t get it, which is really interesting. Maybe Australian audiences will get it?